This property offers good value for money and is located in a lively area of central Madrid, just 50 meters from the Plaza Mayor. 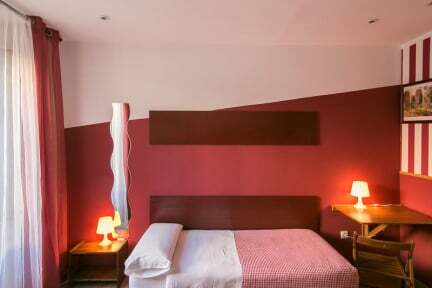 It offers 24-hour reception and simple rooms with free Wi-Fi. 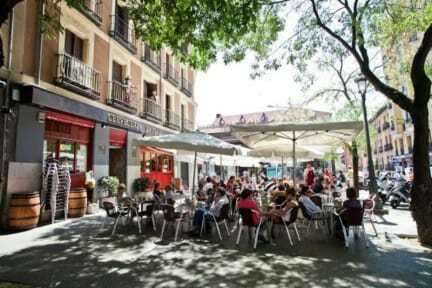 The Casa de la Plaza is located at Plaza San Miguel, where there is a daily market. The Royal Palace is a 4 minute walk. The Opera Metro station providing easy access to the rest of the city. Rooms at La Casa de la Plaza have wooden floors. A TV and a shared bathroom with hairdryer. Some have balconies. The cancellations are to be made with 48 hours of anticipation in order not to be charged. If not, the 100% of the first night will be charged. In case of No Show the 100% of the first night will be charged. Ein Hostel in super Lage! Leider hatte mein Zimmer kein Fenster, was aber kaum auffiel, da ich ohnehin kaum dort war. Alles war sauber und ich habe mich dort sehr wohl gefühlt. Allgemein würde ich dieses Hostel auf jeden Fall wieder besuchen und weiterempfehlen. Das Preis-Leistungsverhältnis ist gut. Die Übernachtungen sind am besten für Leute, die das Nachtleben gerne haben, da es auch mal lauter wird oder einen Kurztrip für 1-2 Nächte. You literally pay for a bed and that's it, but that is ok. Bare in mind that the rooms without air conditioning are very hot in summer. Otherwise the location is the best, close to all tourist attractions. My room lacked a window and I didn't like it, but this is what happens when you travel on a budget. As a solo traveler for a short time, I found this place just right. Für ein paar Tage, wenn man den ganzen Tag unterwegs ist, ist es sehr gut. Ich würde wieder Buchen. A room barely large enough to fit a bed in, without a window or any fresh air supply is known as a broom closet. You should certainly not rent it out to actual humans. Besides that, the house was run down, the showers were dirty, and the staff who kindly kept my luggage for the day almost handed me the backpack of someone else. Careless... Really, location is the only thing going for this place. It's unbeatably central.